Anyone can start a business, your age, gender and background are not important. If you have an idea and the passion to put to it to work, then you're on for an adventure. As an entrepreneur you may be great at organizing your own time and managing yourself, however, you can't do everything on your own and you'll have to hire new employees (if you haven't already) and now, you must manage people, and yourself, and stay motivated to keep growing your business, all at the same time. For some, this is a task, and for others, it comes so naturally that they don't even realize they're doing it. Either way, your managing style and your way of managing others must be addressed. 1. Anyone can be a manager, not everyone can be a leader. A manager will have subordinates; a leader will have followers. 2. 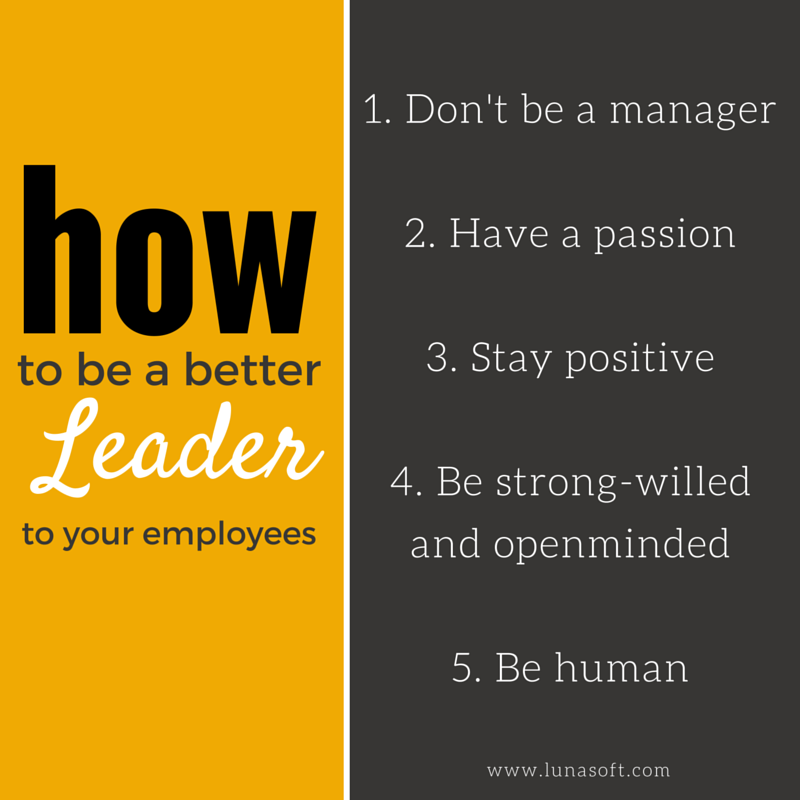 Have a passion for what do you, and teach your employees why it should be their passion too. Your employees can see how your eyes light up when you talk about your product, and they fall in love with it every-single-time. Keep the passion alive, and those who follow you, will follow your dreams too. 3. Stay positive. Employees like it when their employers are real, don't pretend that you don't have any problems, but don't hide them either. Above all, stay positive, because those who follow you need your energy in order to stay positive themselves. 4. Be strong-willed and openminded. This sounds like a hard thing to do, but your employees need you to be strong-willed and trustworthy. If you say you'll have a meeting every Tuesday at 9am, then stick to your word and have that meeting every Tuesday at 9am; however, if one day you can't make it, or someone else can't make it to the meeting, don't beat yourself up or punish the missing employee. Be openminded to change the course of the trip. 5. Be human. Many employers feel the need to be serious and formal with their employees at all times, but the truth is, that doesn't make them more professional, it just makes them look serious and even insecure that if they crack a joke or seem less-than-professional their employees won't take them seriously. Employees know their employers are human just like them, they have families and problems like everyone else, so when they hide who they really are, employees don't feel as close to them. As an employee, what other characteristic do you look for in an employer? And as an employer, how do you deal with the points above?